What these terms cover. These are the terms and conditions on which we provide our services to you. THESE TERMS WILL PREVAIL OVER ANY TERMS ISSUED BY YOU. YOUR ATTENTION IS PARTICULARLY DRAWN TO CLAUSES 9.2 – LIMITATION OF LIABILITY AND 5.2 LIABILITY FOR THIRD-PARTY CONTENT. 1.1 Who we are. 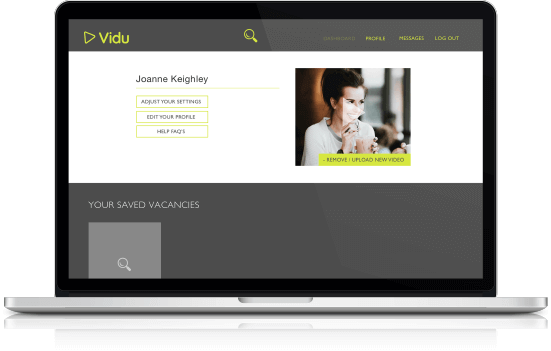 We are Vidu Video Recruitment Ltd a company registered in England and Wales. Our company registration number is 11436626 and our registered office is at Suite 314, Copthall Bridge House, Station Bridge,Harrogate,HG1 1SP. 1.2 How to contact us. 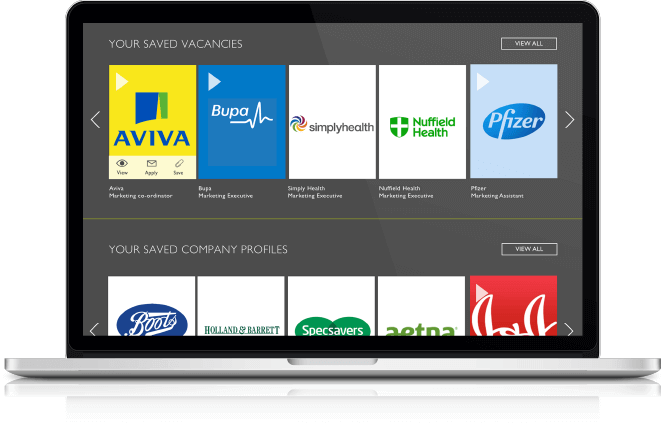 You can contact us by writing to us at contactus@viduvideorecruitment.co.uk. 1.3 How we may contact you. If we have to contact you we will do so by telephone or by writing to you at the email address or postal address you provided to us when you filled in your Subscription Form. 2.1 How we will confirm your subscription. Our acceptance of your subscription will take place when we email you to accept it, at which point a contract will come into existence between you and us with these terms applying. 2.2 If we cannot accept your order. If we are unable to accept your subscription, we will inform you of this and will not charge you for the subscription. 3.1 In consideration for the Subscription Fee we shall provide our services as confirmed on your Subscription Form with these terms applying. 3.2 We undertake that our services will be performed substantially as set out in our Service Policy and with reasonable skill and care. 3.3 We warrant that we have and will maintain all necessary licences, consents, and permissions necessary for the performance of our obligations under this agreement. a) provide us with all the necessary co-operation in relation to this agreement. c) be solely responsible for procuring and maintaining your internet connection and all loss or damage arising from or relating to your internet connection. and we reserves the right, without liability or prejudice to our other rights, to withdraw your access to our services without compensation should you breach the provisions of this clause. e) attempt to obtain, or assist third parties in obtaining, access to the services. 4.4 You shall use all reasonable endeavours to prevent any unauthorised access to, or use of, our services and, in the event of any such unauthorised access or use, promptly notify us. 5.1 You acknowledge that our services enable or assist you to access website content of third parties (including potential candidates) via our website and third-party websites and that you do so solely at its own risk. We makes no representation, warranty or commitment and shall have no liability or obligation whatsoever in relation to the content or use of, or correspondence with, any such third-parties, or and any contract entered into by you with any such third party. Any process or contract entered into with a third-party is between you and the relevant third party, and not us. We do not endorse or approve any third-party, their content, or the content of any of the third-party website made available via our services. 5.2 Liability for third-party content – The content on our website is provided for general information only and full details of any information posted by third parties, including candidates, should be sought from the poster. Although we make reasonable efforts to update the information on our site, we make no representations, warranties or guarantees, whether express or implied, that the content on our site is accurate, complete or up to date. 6.1 You acknowledge and agree that we and/or our licensors own all intellectual property rights in our services. Except as expressly stated in these terms, these terms do not grant you any rights to, under or in, any patents, copyright, database right, trade secrets, trade names, trade marks (whether registered or unregistered), or any other rights or licences in respect of our services. 6.2 We confirm that we have all the rights in relation to our services that are necessary to grant all the rights it purports to grant under, and in accordance with, the terms of this agreement. 6.3 You provide us with a licence to use the intellectual property rights contained within any content that you upload on to our website for the duration of the Subscription Term. 7.1 How to tell us about problems. If you have any questions or complaints about our services please contact us. 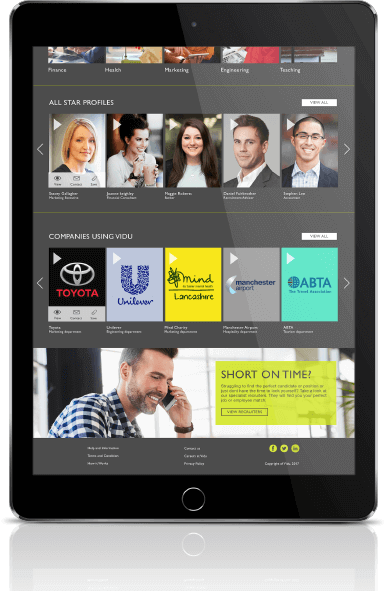 You can write to us at contactus@viduvideorecruitment.co.uk. 8.1 Where to find the price for our services. The price of our services (which excludes VAT) will be the price confirmed on your Order Confirmation. 8.2 We take reasonable care to ensure that the price of the product advised to you is correct. However please see clause 5 for what happens if we discover an error in the price of the product you order. 8.3 In consideration for our providing our services your will pay our Charges as set out in our Order Confirmation either in advance, monthly in advance or as stated within your Order Confirmation. 8.4 We will pass on changes in the rate of VAT. If the rate of VAT changes between your order date and a date when payment falls due, we will adjust the rate of VAT that you pay, unless you have already paid for the services in advance before the change in the rate of VAT takes effect. 8.5 What happens if we got the price wrong. If the Subscription Fee on the order page is incorrect we will contact you prior to confirming your subscription. 8.6 Our right of set-off. You must pay all amounts due to us under these terms in full without any set-off, counterclaim, deduction or withholding (other than any deduction or withholding of tax as required by law). 8.7 We can charge interest if you pay late. If you do not make any payment to us by the due date we may charge interest to you on the overdue amount at the rate of 4% a year above the base lending rate of the Bank of England from time to time. This interest shall accrue on a daily basis from the due date until the date of actual payment of the overdue amount, whether before or after judgment. You must pay us interest together with any overdue amount. 8.8 What to do if you think an invoice is wrong. If you think an invoice is wrong please contact us promptly to let us know. You will not have to pay any interest until the dispute is resolved. Once the dispute is resolved we will charge you interest on correctly invoiced sums from the original due date. 8.9 We have the right to increase the charges due by a reasonable amount once every 12 months subject to providing you with 30 days’ notice. ii) use of or reliance on our services. c) our total liability to you for all other losses arising under or in connection with any contract between us, whether in contract, tort (including negligence), breach of statutory duty, or otherwise, shall be limited to the total sums paid by you for our services under this contract. d) The exclusions in this clause 2 will not apply to the indemnity provided under clause 10.4.
to process your payment for our services. 10.2 How you will use your personal information. 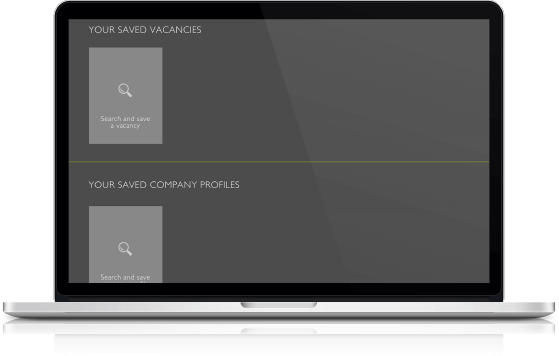 You will only use the personal information we provide you in relation to recruitment activity. 10.3 Both of us shall comply with data protection requirements as required by the Data Protection Act 1998 and the General Data Protection Regulation, and any replacing legislation, including the Data Protection Principles (as defined by the relevant legislation). 10.4 Both of us warranty that we will each comply with clause 3 and will indemnify the other for any losses they suffer as a direct result of our breach of clause 10.3. 11.2 and the Initial Subscription Term together with any subsequent Renewal Periods shall constitute the Subscription Term. c) the other party becomes insolvent or similar. 12.1 These terms constitute the entire agreement between us in relation to our services. You acknowledge that you have not relied on any statement, promise, representation, assurance or warranty made or given by or on behalf of us which is not set out in these terms and that you shall have no claim for innocent or negligent misrepresentation based on any statement in this agreement. 12.2 We may transfer this agreement to someone else. We may transfer our rights and obligations under these terms to another organisation. 12.3 You need our consent to transfer your rights to someone else. You may only transfer your rights or your obligations under these terms to another person if we agree to this in writing. 12.4 Nobody else has any rights under this contract. This contract is between you and us. No other person shall have any rights to enforce any of its terms. Neither of us will need to get the agreement of any other person in order to end the contract or make any changes to these terms. 12.5 If a court finds part of this contract illegal, the rest will continue in force. Each of the paragraphs of these terms operates separately. If any court or relevant authority decides that any of them are unlawful, the remaining paragraphs will remain in full force and effect. 12.6 Even if we delay in enforcing this contract, we can still enforce it later. If we do not insist immediately that you do anything you are required to do under these terms, or if we delay in taking steps against you in respect of your breaking this contract, that will not mean that you do not have to do those things and it will not prevent us taking steps against you at a later date. For example, if you miss a payment and we do not chase you but we continue to provide the products, we can still require you to make the payment at a later date. 12.7 Which laws apply to this contract and where you may bring legal proceedings. Any dispute or claim arising out of or in connection with a contract between us or its subject matter or formation (including non-contractual disputes or claims) shall be governed by and construed in accordance with the law of England and Wales and the courts of England and Wales shall have exclusive jurisdiction to settle any such dispute or claim.